One of the several reasons this blog has not being updated on a daily basis, is that I had so many good books to read, books that were not only in a wish list, but were already sitting on my shelves waiting to be read. Every time I passed by I could feel them staring at me with that reproach look that only a mad book knows how to give. I could not stand the thought, “What if all those letters decide to come out from the pages and hunt me one night…” Too risky. So I decided to follow one of Wilson’s advice and try start reading about two books a week. So far, so good. And I am very happy. No more books staring at me anymore. I now walk pass by the shelves, and give those books that look and can almost see them smiling at me. 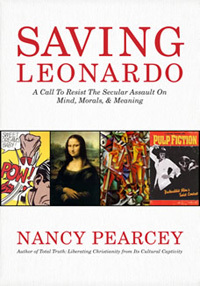 This weekend I finished reading an amazing book, Saving Leonardo: A Call to Resist the Secular Assault on Mind, Morals, & Meanings by Nancy Pearcey. This is a book that if it were a concert, I would have raised to my feet at the end of it to give an ovation to the author. I totally recommend it for every Christian who loves arts but also for those who doesn’t understand the arts. It is a book for thinkers who love the Word of God and live, like the rest of us, in a fallen world where world-views must be discerned. Yes, in short, this is a book for all Christians. Even more astonishingly, we ourselves have the opportunity to participate in that drama through our own lives. The Bible’s doctrines are inseparably rooted in the history of ordinary human beings… The implication is that every one of us, though we too are ordinary people, can lead lives imbued with the same world-revolutionary significance as we participate in the unfolding of God’s redemptive plan. Isn’t this exciting to read? Isn’t it exciting to know that we are part of God’s story? This entry was posted in Books, My_Thoughts by Becky Pliego. Bookmark the permalink. Sounds like a great book that I need to add to my list. Thank you Becky for your support of Nancy's writing! We need more thinkers who write…Kinda like you! Persis, guess what? Total Truth is one of the books waiting for its turn on my shelves! Nancy Pearcey is a God-given gift to the church. She is a meticulous and thinker; and through her words one can easily perceive her love and passion for the Gospel. I just finished Total Truth by Nancy Pearcey this week. I was floored by that book. Consequently, I've been eyeing Saving Leonardo and The Soul of Science.